Naqshbandiya Foundation for Islamic Education: HAZRAT KHAWAJA BAQI BILLAH R.A.
Khawaja Baqi Billah was the originator and pioneer of the Naqshbandia Order in the sub-continent. His name was Razi-ud-Din Muhammad Baqi but he was commonly known as Khwaja Baqi Billah His father Qazi Abdul Salam Khilgi, Samarkandi Qureshi was a famous scholar and saint of Kabul. KHAWAJA BAQI BILLAH was born at Kabul in 971A.H or 1563A.D. His lineage reaches Kh. Ubaid Ullah Ahrar R.A. through his maternal grandfather. His grandmother came of a Syed family. Hazrat Baqi Billah was admitted to the school of Khawaja Saad at five to learn the Holy Quran. He learnt by heart when he was eight years old. After getting elementary education, he went to Maulana Sadiq Hilvahi R.A.., a famous scholar at the age of 30. Saintliness was reflected from his face from his early childhood. He liked solitude and simple life. He went to Mavara-un-Nahr, which was considered as the centre of Muslim saints at that time. There he met a large number of Sufis and Saint from whom he gathered a lot of spiritual knowledge. Firstly, he attended Khawaja Ubaid R.A. a spiritual caliph of Maulana Lutf Ullah but he was not satisfied. Then he stayed with Hazrat Sheikh Samarkandi who prayed for him but even in his company he did not get the requisite satisfaction. Thereafter, he attended the company of Hazrat Ameer Abdullah Balkhi R.A. from whom he got a little peace of mind. During the period of learning, he was going through a book on Sufisim. Suddenly, he saw that the place was illuminated with light. He saw that Khawaja Baha-ud-Din Nashbandi R.A. was standing before him and showering spiritual favour on him. After this incident, his heart was filled with the love of Allah and the Holy Prophet Sallalaho Alyhe Wasalam. He wandered from Central Asia to India He traveled to Lahore and Multan on foot. Once, when he was offering prayers in a mosque at Lahore, a terrible voice rose from his heart. All the people in the mosque felt terrified. Hazrat Khawaja left the mosque at once after completing his prayers. One of his devotees narrated that, once, when Hazrat Khawaja R.A. was leading prayers, he was looking to Qibla as well as to the people behind. After the prayers Hazrat Khawaja Sahib R.A. advised his devotees not to divulge this secret to anyone else. Hazrat Khawaja Baqi Billah was blessed with great spiritual qualities because of his extra-ordinary love for and obedience to the Holy Prophet Sallalaho Alyhe Wasalam once related that a painful voice came out of the holy heart of the Holy Prophet Sallalaho Alyhe Wasalam while he was offering the prayers. He could see before himself and behind himself at one and the same time. Hazrat Khawaja Baqi Billah once travelled to Mavara-ur-Nahr. On his way, he dreamt that Hazrat Khawaja Amkangi R.A. was calling him and waiting for him anxiously. So, he went to see him at his abode and stayed there for three days. Khawaja Amkangi R.A. blessed him with his Khilafat (spiritual caliphate) and said: "Go to India because this Order (Naqshbandia Silsila) will be established there by you" Hazrat Khawaja Baqi Billah humbly said to his spiritual guide that he could not do that difficult task, but Khawaja Amkangi R.A. insisted and ordered him to get guidance from "Istikharah" (prayer for getting judgment from Allah), Hazrat Khawaja performed "Istikhara". In a dream he saw a parrot sitting on the branch of a tree. He thought that if the parrot sat on his hand, he would consider this journey as a lucky one. No sooner did this thought flashed across his mind, than the parrot flew towards him and perched on his hand. Hazrat Baqi Billah put his saliva into its beak whereas the parrot put sugar into his mouth.Next morning Hazrat Baqi Billah related the whole dream to his guide, who said that he should act in the light of the Istkhara. So, his guide ordered him to leave for India at once. Under the instructions of his guide, he travelled to India and stayed at Lahore for a year. Here a lot of scholars and nobles of the city met him and got spiritual blessings from him. Then he proceeded to Delhi and stayed at Qilla Ferozabad. It was a beautiful place situated on the band of River Jamna. He set up his dwelling in a mosque over there. Sardar Ali Ahmed Khan has highlighted the politico-religious trends of India at the time of Hazrat Khawaja Baqi Billah at page 92 of his book. "The Naqshbandis" as under: "Emperor Akbar's reign (1556-1605) was mostly marked with denial and heresy. In the beginning. Akbar was a Sunni Muslim but under the influence of his tutor Abtul Latif he adopted very liberal views and became a liberal thinker. During his reign he was surrounded by Hindu nobles and scholars as well as by his Hindu wives who had influenced his religious views to a great extent. Faizi and Abw-al-Fazal, two of his couriers, had wormed themselves into his confidence. They enjoyed his patronage, and adroitly influenced and determined his views. Unique in learning and scholarship, they were selfish, and intent upon worldly gains. Asna-Ashrite (a sect of Shite) in their religious views, they did not like that the Sunni Ulama, by gaining the emperor's confidence, should gain precedence over them. Accordingly, they persuaded the ignorant king to introduce Din-i-Ilahi, (Divine monotheism) in the year 1581 A.D, investing him with the rank of a prophet, and Abu-al-Fazl becoming the vice-regent in this respect. Before his evil influence, Akbar held the Ulama in deep respect. As is well known, Jahangir was born in response to Sheikh Salim Chistee's prayer in whom Akbar had profound faith. He also went on foot from Agra to Ajmer for thanks-giving at Khwaja Muinuddin Chistee's Dargah and to reiterate his faith in him. But after the introduction of Din-i-Ilahi, he tried to deform Islam. Like the Hindus, he marked his forehead with the Qashqa (to mark forehead), worshipped the sun, and married daughters of the Hindu Rajas and kept dogs and pigs as pets. Instigated by Abu Al-Fazl, he asked the Ulama to subscribe to Din-i-Ilahi, and on their refusal, they were expelled from the court. All the same, there were some self-seeking Ulama who embraced Din-i-Ilahi and issued Fatawas (decrees) in support of Akbar's anti-Islamic activities. They accepted him as the supreme head of religion and grand arbiter in spiritual and religious controversies." Hazrat Khwaja Baqi Billah strengthened the Naqshbandia Order in India. His contacts with the nobility of the Mughal Empire proved useful for the reformation of the Muslims of India. He took bold steps and played a heroic role to stop the prevailing heresy known as Din-i-Ilahi. His writings and counsels encouraged the people to combat this very innovation. The nobility also favoured him and he used their power for the betterment of the Muslims. He stressed on Sharia during the whole of his life and influenced the people by virtue of his piety and his strict adherence to the Sunnah. He preferred Sharia to Tariqah (Sufism) and reformed the Sufis and Ulama of that time. Khwaja Muhammad Kishmi, a disciple of Hazrat Mujaddid Alif Sani, writes about the achievements of Hazrat Baqi Billah as under: “Probably his greatest achievement is that in two or three years, he firmly established the Naqshbandi Order in India, whereas others of the same Order lagged behind and worked for many years". A tribute higher than, the following one paid by Hazrat Mujaddid Ali Sani R.A. to Hazrat Baqi Billah cannot be paid to any one else:"I am convinced that such training as I received from him has hardly been given by anyone else after the Holy Prophet Salallaho Alyhe Wasalam. I did not enjoy the Prophet's company but I thank Allah, I was not denied the honour of Khwaja Baqi Billah's R.A. Company." In fact, extra-ordinarily firm faith in the supremacy of God Almighty and strict adherence to Sunnah had elevated Hazrat Baqi Billah to such heights of spiritual excellence as could not be attained by any other saint of the Naqashbandi Order. He is indisputably, reckoned to be the greatest herald and torch-bearer of the Order, which he practised. He is incomparable and a class apart in his own line All words, deeds and actions of Hazrat Baqi Billah which were in the wake of the Holy Prophet Sallalho Alyhe Wasalam, worked miracles quite spontaneously. Many of his miracles, reflecting his immense love for his fellow beings and exhibiting his sympathy with other creatures of Allah Almighty adorn the pages of books, which have been written on him. Since it is difficult to mention all his miracles in this short article, only a few of them have been related as under: One, late at night, a few guests of Hazrat Baqi Billah came to see him. Since no foodstuff was available at home, he asked the baker, who held Hazrat Baqi Billah in great esteem and reverence, to serve the guests as directed. After having served the guests, the baker appeared before Hazrat Baqi Billah and demanded his remuneration. Hazrat Sahib asked the baker how much he was to pay for the dinner. On his own part, he tried to pay the price of the dinner but the baker declined to accept the remuneration in terms of money. The baker requested Hazrat Baqi Billah to make him just like him. Out of great love, which Hazrat Baqi Billah cherished for his fellow beings. Hazrat Baqi Billah took the baker into his (Hujra) room, embraced him, and transformed him into his own facimile When Hazrat Baqi Billah and the baker came out of the room, both of them resembled each other so closely that it was difficult for the people to distinguish between the two. The only difference between them was that whereas the actual Baqi Billah performed his duties, as usual, in a normal way, the transformed Baqi Billah lay lost in trance. Being unable to bear the stress of the great spiritual blessing showered upon him, the baker expired after three days. Another miracle, showing Hazrat Baqi Billah's love for any sympathy with other creatures of God, deserves special mention. It is said that one night Hazrat Baqi Billah after having offered his Tahajad prayers, stepped towards his bed to take some rest. To his great surprise, he saw a cat couching in his bed. Blessed and gifted as Hazrat Baqi Billah was with a kind and benign heart, he did not disturb the cat. He quietly sat down on the floor and passed the rest of the night in the chilly winter, whereas the cat enjoyed a sound sleep till morning. According to Hazrat Khwaja Baqi Billah Tovakkal (trust in Allah) does not mean that a person should not earn his living and become idle. This would be an act of disobedience to Allah. A person should do some work to earn his living, and should have a strong faith that only Allah is the Sustainer. Work is just like a source, mediation or an intersessor. There is a great moral lesson for our modern youths to learn from the philosophy and preaching of this great saint. In fact, according to all Nashbandi Sufis and saints, escape from the struggle of life is a cowardly and a selfish act. According to Hazrat Khwaja Baqi Billah R.A a hermit lives in a world of dreams, whereas to the adventurous and the brave, this world offers a splendid scope to struggle for existence. Sardar Ali Ahmed Khan, has remarked as under: "Judged by results, the greatest event of the life of Hazrat Baqi Billah. was the enrolment of Hazrat Mujaddid Alif Sani as his disciple in 1599." Hazrat Khwaja Baqi Billah R.A went his way to eternity on 25 Jamadi-ul-Sani 1012 A.H. or 1603 A.D. His grave is situated in Delhi near the Qadam Sharif (foot-prints) of the Holy Prophet Sallalho Alyhe Wasalam at a platform. No dorne was constructed over his grave according to his will. There is no tree to cast a shadow on the grave. In spite of this, the visitors do not feel the effect of heat when they stand barefooted beside the grave. BIBLIOGRAPHY- M. Ikram: Maadn-e-Karm. 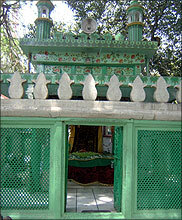 Aastana Aalia Hazrat Karman wala Okara 2001, A.D.S. Zarwar Hussain: Hazrat Mujaddid Alif Sani Karachi 1989. Masadn-e-Karam P.293.Sardar Ali Ahmed Khan: The Naqshbandis Sharaqpur Sharif-1992.